I’m on the road with the StartupBus Europe trip to LeWeb. When you left us yesterday, the ‘buspreneurs’ were busy forming teams around the ideas they had pitched. 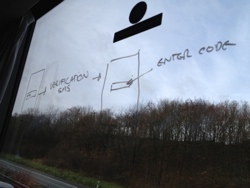 As we sped down the autobahns of north Germany, the product ideas were honed and many ideas were sketched out on paper, and even on the bus’ windows. Following a short ferry trip to Denmark, we rolled into Copenhagen – one of Europe’s most exciting startup cities. Our host for the evening was Startup Bootcamp, where the 2011 group of startups left last week but things are far from quiet as the accelerator franchise plans for a busy 2012 around Europe. LocaFoo: For iPhone and Android, this location-based game will see you picking up virtual items around you to attack and defend against your friends. Brands will be encouraged to get involved. Perhaps you could throw a Starbucks coffee or a McDonalds hamburger at your opponents.The app will have Foursquare and Facebook integration. BUT: Will brands want their products used as weapons? Buybone (working title): Imagine a version of eBay where you list your needs and customers bid to sell your their products. Whether the seller is down the road or on the other side of the world, this will be a safe way of buying without being ripped off, with Buybone acting as an escrow service. 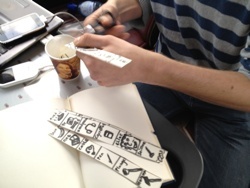 BUT: Will the team have their wireframes ready by the time we get to Berlin in a few hours time? YoBro: – This is instant mobile group audio chat for shared interests. The service links people with shared interests. Type in an interest and the app will link you with others who have entered the same text. A natural link here is to gather around Twitter trending topics. To prevent rooms getting too noisy, each will be limited in size before a new room is automatically generated. BUT: Do people want to group audio chat with strangers? And where’s the money? Wander: – Trips and travel are fun, and planning should be too – that’s the premise behind Wander. It will allow you to create a personal travel guide. It will be available when mobile, with timeline and map for exploring. It will emphasise spontaneity – as you explore a location, it will tell you when a point of interest you want to visit is nearby. There will be an offline mode for when you don’t have access to mobile data. BUT: Who is the specific target market? Invoi: – The aim here is to disrupt voicemail, by making it interactive. The team is building a service that uses voice recognition, translating voicemail to tasks and events. The user will be able to set conditions – so, for example, when certain words are said in voicemail messages, you can get the service to call someone else, make a to-do list and more. BUT: Can the team get a working demo completed in time? After a short sleep in a Copenhagen hostel, we’re on the road again, bound for Berlin. After a brief stop there we’ll be moving again as we head for today’s final destination of Zurich. We’ll keep you posted on the teams’ progress as we make our way towards our ultimate destination in Paris tomorrow evening. 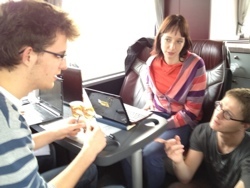 In the meantime, you can invest virtual cash in your favourite idea on the StartupBus Stock Exchange game. You can also join us in Berlin at an event this afternoon. Click here for more details.